The new mobility guide of Circostrada! In the past few years, artistic collaborations between Europe and Asia in the field of circus and street arts have never been more developed. However, information about Asian artistic circus and street art scene as well as those international collaborations seem not easily found and accessible for cultural professionals. 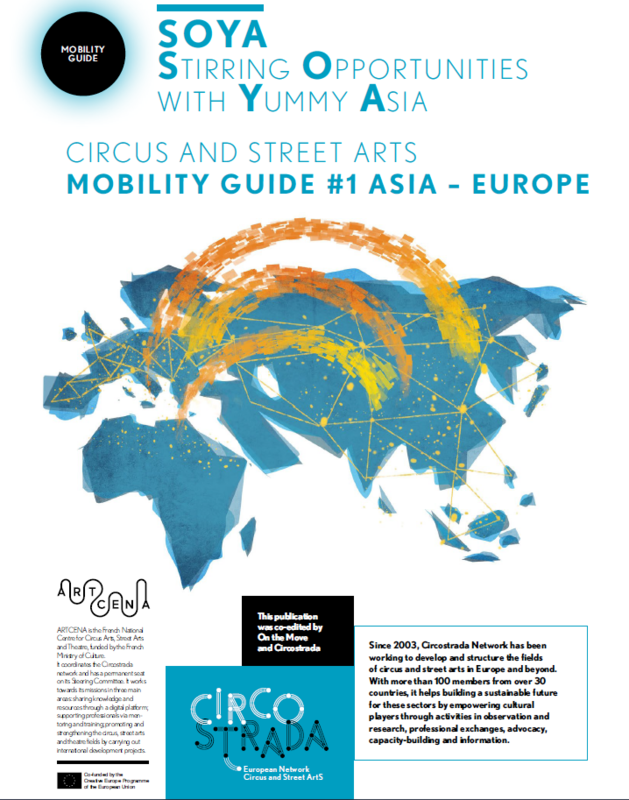 After the first research trip of Circostrada in Japan in December 2016 and in the perspective of the next one in South Korea in October 2018, the network has decided, in partnership with On the Move, to create a mobility guide between Europe and Asia. Based on the needs and the strong interest of the fields, Circostrada presents its first mobility guide: SOYA – Stirring Opportunities with Yummy Asia. Conceived as a hand-on tool, it aims to be resourceful and inspirational for future collaborations. It not only gives an overview and a mapping of Asian artistic scene in circus and street arts, it helps also to organise and plan a mobility project for all cultural players through funding mobility schemes, administrative advices and inspiring collaboration testimonies.